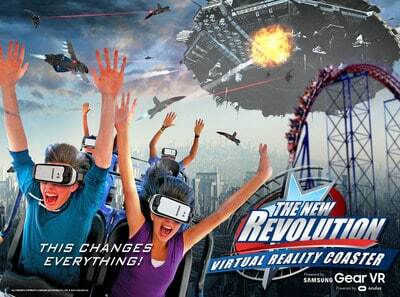 Amusement parks are upping the ante for 2016 with the roll out of virtual reality roller coasters. Both Six Flags in North America and Merlin Entertainments in the United Kingdom have recently announced the addition of VR coasters to their lineups, including a VR update to the Goliath “hypercoaster” at La Ronde, Six Flags’ amusement park in Montreal, Quebec. Six Flags has just announced that it is partnering with Samsung and Oculus to launch VR coasters at nine of its amusement parks across the United States and Canada. The move is part of the wider dispersal of virtual reality devices into more and more corners of the entertainment and information sectors as the cost and functionality of VR technologies become more attractive. In January, Merlin Entertainments announced the VR refitting of Galactica, its Alton Towers roller coaster in Staffordshire, England. “This remarkable technology is a definite game-changer for theme park rides and represents everything our brand stands for – delivering the most thrilling and innovative rides,” said Phil Liggett, President of La Ronde. In an interview with CNBC, George O’Connor, technology analyst with investment bankers Panmure Gordon, foresees virtual reality technology playing a larger role in the technology sector along with developments in artificial intelligence and big data analysis. “We can see a shift in how people ‘communicate’ (and embrace) with the [VR] technology,” says O’Connor. Virtual reality is also popping up on TV – and in the backseat of a Lexus near you. Fortune magazine has announced that the March 6th episode of ABC’s television drama Quantico will be paired with a VR component in which fans will take on the role of a new FBI recruit on a mission with Quantico’s Shelby Wyatt and Caleb Haas, while (virtually) riding in the back of a Lexus LX 570 SUV, no less. ABC has teamed up with Lexus (a division of Toyota) and virtual reality network Littlstar to coordinate the experience, allowing viewers to participate in the VR scenario with any of a number of VR-capable devices. The Six Flags virtual reality coasters will be free with admission to Six Flags park goers.